KawaiiPunk - Kawaii Mascot Blog: Hooray for Happy Thought! Well readers, the so called “party season” may be over for another year but, if you’re anything like me, that doesn’t mean the parties are going to be stopping anytime soon! After all, it’s less than a month to go until Valentines Day, and I know I’m going to partying hard when that rolls around! And then there’s all those birthday parties I’ll have to attend! And house warmings! And parties for the sake of parties! Just what am I going to do? 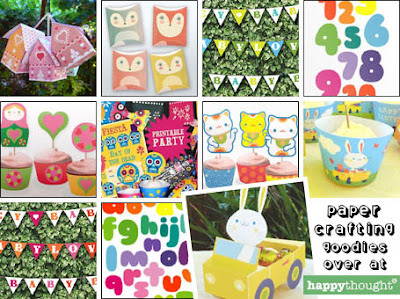 How about getting all my party supplies from the adorable Happy Thought Papercrafts shop? Yes, at the creatively crafty Happy Thought store you can buy all your gift giving and party accessories in one beautiful place - including gift boxes, celebration garlands, and even greeting cards and stationery! Absolute party perfection! Have fun!